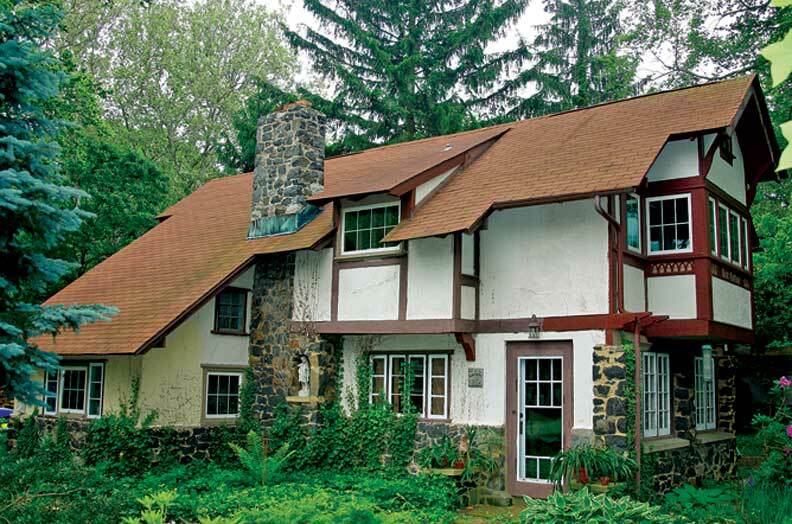 The Castle (1923) represents the essence of the community—a historic cottage, restored, rehabbed, and added to over the years. 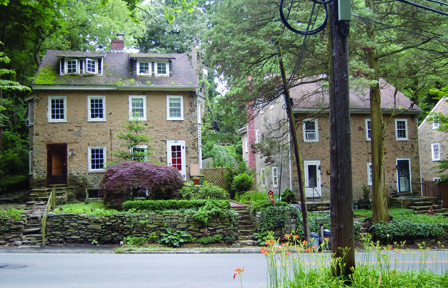 North of Wilmington, Delaware, in a niche created by two busy roads and a pair of creeks feeding the Delaware River, sits a tiny village with an intriguing past and an array of Arts & Crafts-era buildings in a period-perfect landscape. The Village of Arden echoed the era’s bent toward social improvement, simplicity, and artistic and intellectual activity—with a dollop of whimsy tossed into the mix. Named for Shakespeare’s storied forest of the same name, Arden welcomed bohemians, free-thinkers, and reformers of every ilk—artists, writers, academics, suffragists, socialists, communists, and anarchists—all refugees from the evils of the Industrial Age and its rampant capitalism. In 1900 Frank Stephens, a Philadelphia sculptor, bought a rundown farm near Wilmington, intending to turn it into a social, economic, and artistic demonstration project illustrating the truth of economic crusader Henry George’s Single-Tax philosophy (see “The Single Tax System,” page 61) and British art critic William Morris’ aesthetic tenets. 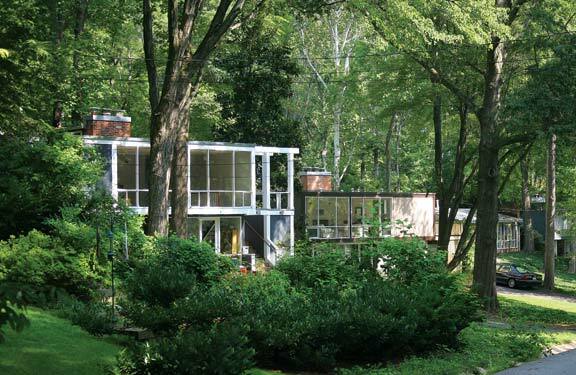 Stephens’ main collaborators were two other Philadelphia Georgists: noted architect William Lightfoot (Will) Price, who founded the Arts & Crafts community of Rose Valley in nearby Pennsylvania in 1901, and philanthropist Joseph Fels, heir to the Fels Naptha soap fortune. This workshop has a heavy timber frame replete with both horizontal and vertical sheathing. At first, Arden was a summers-only paradise with a hodge-podge of tents and rough huts erected by Ardenites in boulder-strewn fields. Here they plied their crafts, practiced their arts, engaged in learned discourse, and played their pranks, surrounded by music, drama, pageantry, and the charms of nature. 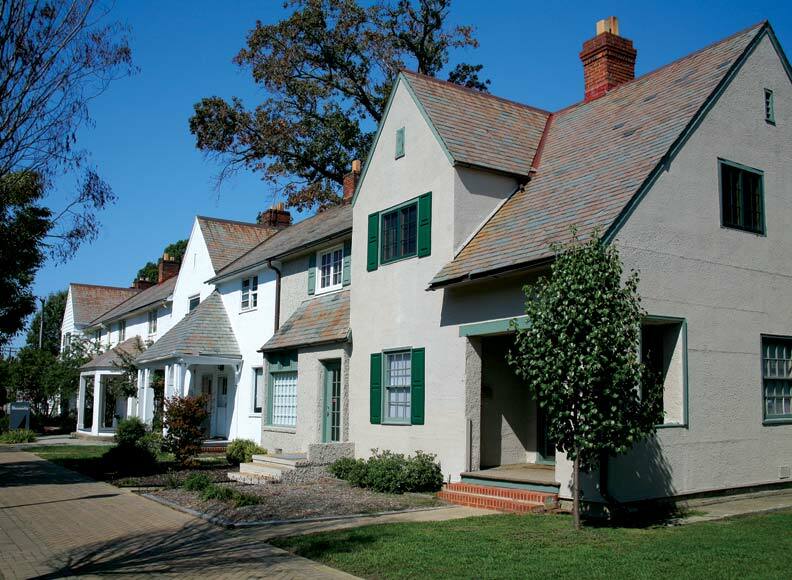 That Arts & Crafts was indeed a movement and not a single architectural style becomes clear in Arden’s major buildings—Will Price-designed houses and community buildings such as the Gild Hall, Library, and Craft Shop. 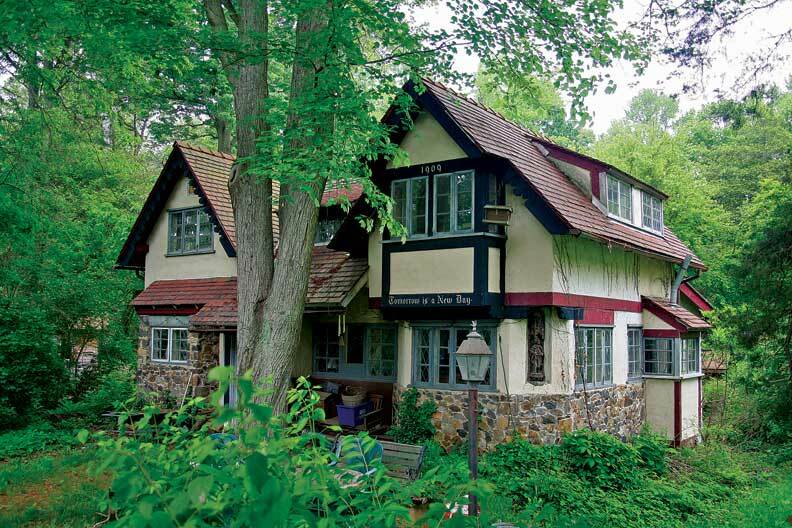 These rambling, picturesque, half-timbered, white-stuccoed structures evoke a sense of 16th-century rural England, a place and time far removed from 20th-century industrialized America. Free-spirited adaptations, they were based on English models because Arden’s founders viewed England not only as the spiritual home of the Arts & Crafts movement, but of their own national heritage as well. Price’s The Rest represents early Arden houses on the Green, built with a mixture of stone and stuccoed half-timbering; wide, sloping roofs; and projecting bay windows. Many Arden buildings have similar plaques and tiles set into their walls, as well as inscribed mottos and identifying titles. The name of the Rest House, located on the Green near the Founder’s House, appears on a projecting bay. The house has a long, low-sweeping gable on one side, covering its three-story height above a stone base course, with half-timbering, projecting exposed beams, and a scroll console that supports a bay window. The roof is covered in asphalt shingles, but the originals were probably tile, since Fels, the financier, stipulated such a covering in his mortgage agreements. Set into a chimney is an arched niche containing a small piece of sculpture. The porches take on a rustic air with tree-trunk posts, and a large fieldstone chimney suggests a warm and happy hearth within. The dark, almost black stone used here is found in some other Arden buildings as well. Ardenites were (and are) fondly respectful of their houses’ history, but they have always been too independent-minded to put tradition above utility and their individual aesthetics. At the Castle, built by an artist in 1923, a complex series of additions made over many years to the original, generally Old English-style house has resulted in a small, picturesquely attractive tower. In the front garden, an old workshop with an exposed timber frame and a mix of vertical and horizontal siding is still used by the present residents, an art gallery owner and a kitchen specialist, for their own projects. Inside are a massive fireplace with Batchelder tiles from California, beamed ceilings, and a distinctive Arden Forge iron chandelier hand-wrought in the village. The well-known wooden Stile Gate into Arden opens to a picturesque walkway leading to the Green. 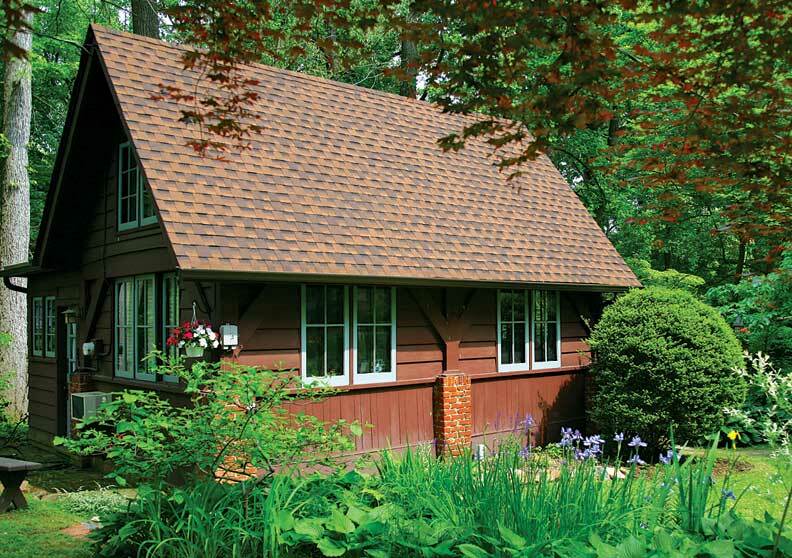 The cozy bungalow, popular all over the country in the Arts & Crafts period, is also well-represented in Arden, where its simple form displays knowingly crafted local stone, wood, and clay features. Gustav Stickley, whose Craftsman Homes books and The Craftsman magazine enthralled potential homeowners of the early 20th century, was a major proponent of the hand-built or semi-hand-built American classic. In Arden, one resident who opted for such a home was Upton Sinclair, author of the famous muckraking novel The Jungle, who lived in his Fels-financed shingled bungalow (quickly dubbed the “Jungalow” by irreverent Ardenites) for only a couple of years. The house is still there. More than a hundred years after its beginnings, the cultural and intellectual spirit of Arden is as exuberant as ever, with pageants, plays, musicals, and lectures filling the village calendar. 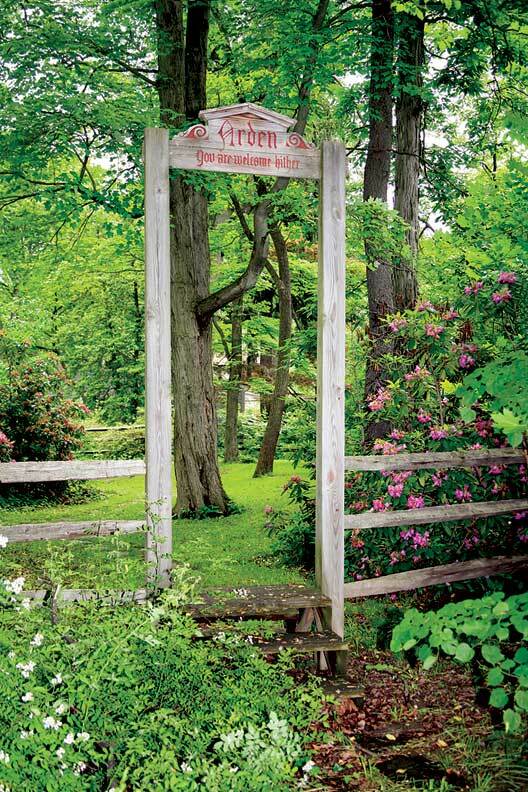 As always, the little community’s motto might well be “You are welcome hither”—Shakespeare’s words, inscribed on the wooden stile at the village entrance. 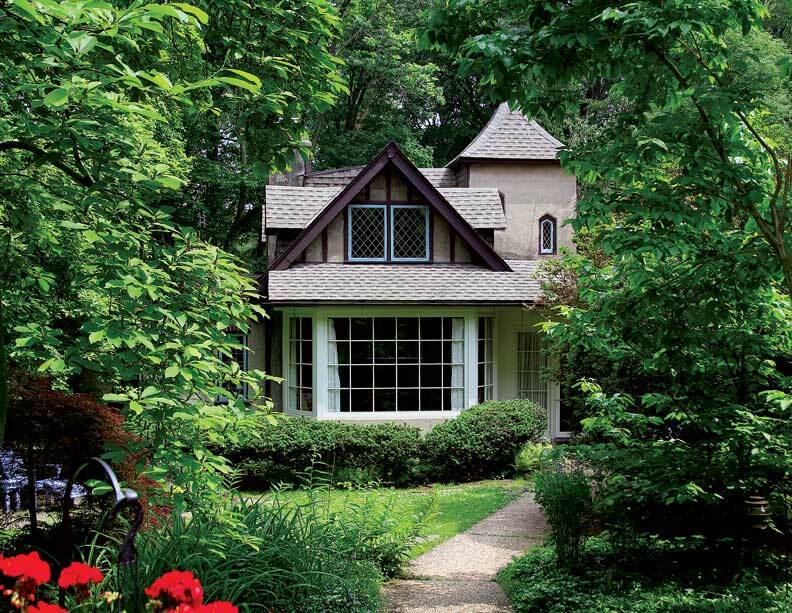 Online exclusive: See our roundup of other experimental Arts & Crafts communities.